Chemistry X | Acids, Bases and Salts | What Happens to an Acid or a Base in a Water Solution? Do acids produce ions only in aqueous solution? Let us test this. Take about 1g solid NaCl in a clean and dry test tube and set up the apparatus as shown in Fig. 2.4. Add some concentrated sulphuric acid to the test tube. What do you observe? Is there a gas coming out of the delivery tube? Test the gas evolved successively with dry and wet blue litmus paper. In which case does the litmus paper change colour? 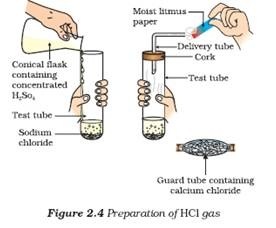 Note to teachers: If the climate is very humid, you will have to pass the gas produced through a guard tube (drying tube) containing calcium chloride to dry the gas. This experiment suggests that hydrogen ions in HCl are produced in the presence of water. The separation of H+ ion from HCl molecules cannot occur in the absence of water. Hydrogen ions cannot exist alone, but they exist after combining with water molecules. Thus hydrogen ions must always be shown as H+(aq) or hydronium ion (H3O+). We have seen that acids give H3O+ or H+(aq) ion in water. Let us see what happens when a base is dissolved in water. Bases generate hydroxide (OH–) ions in water. Bases which are soluble in water are called alkalis. All bases do not dissolve in water. An alkali is a base that dissolves in water. They are soapy to touch, bitter and corrosive. Never taste or touch them as they may cause harm. Which of the bases in the Table 2.1 are alkalis? Let us see what is involved when water is mixed with an acid or a base. Take 10 mL water in a beaker. Add a few drops of concentrated H2SO4 to it and swirl the beaker slowly. Touch the base of the beaker. Is there a change in temperature? Is this an exothermic or endothermic process? The process of dissolving an acid or a base in water is a highly exothermic one. Care must be taken while mixing concentrated nitric acid or sulphuric acid with water. The acid must always be added slowly to water with constant stirring. If water is added to a concentrated acid, the heat generated may cause the mixture to splash out and cause burns. The glass container may also break due to excessive local heating. 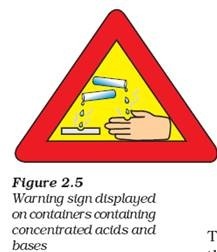 Look out for the warning sign (shown in Fig. 2.5) on the can of concentrated sulphuric acid and on the bottle of sodium hydroxide pellets. Mixing an acid or base with water results in decrease in the concentration of ions (H3O+/OH–) per unit volume. Such a process is called dilution and the acid or the base is said to be diluted.